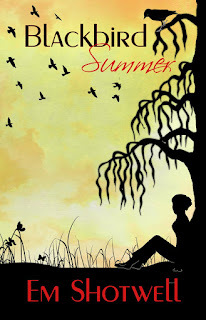 Today, we're taking a look at Em Shotwell's Blackbird Summer. Recently released by City Owl Press, this is a new adult, rural fantasy features a romance, but even more than that, focuses on family. 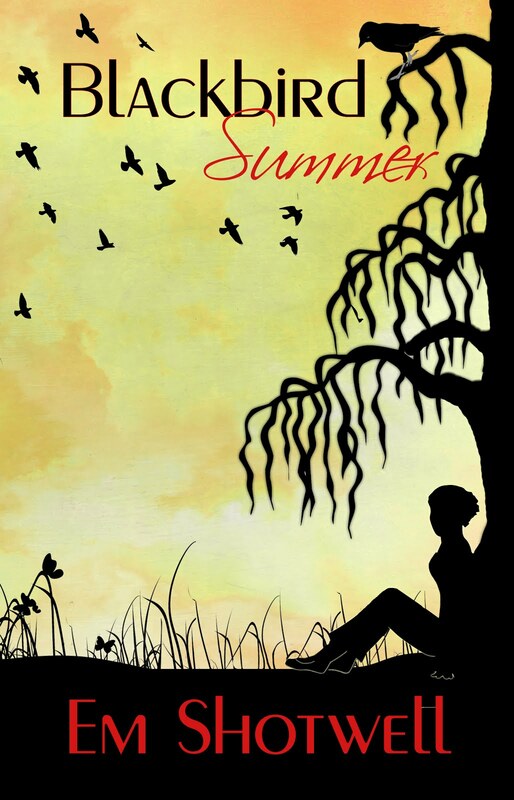 Blackbird Summer is available now! Before I could talk myself out of the whole thing, I shoved open the door and marched in. “Myrtle I just need to…” I started, my eyes trained on my sneakers. My heartbeat filled my ears and I dried my palms on my jean shorts. “I just want to apologize.” I said to the floor, scared that if I looked up I would lose my nerve. “She’s in the back,” said the deep voice from earlier. I jerked my gaze upward. Crap. I had been in such a hurry, I hadn’t thought about the other customer. Or even Loretta, who I knew would love to see me squirm. The man from the booth was standing by the counter in the front of the diner. I clenched my mouth shut, embarrassed at the thought of what this man might have heard, and scared that if I talked that I would only make it worse. The holes in my plan now stood out in my mind, gaping wide and taunting me with how dumb the entire idea had been. Things could not get any worse. “Are you ok?” The stranger asked. The back of my neck prickled, the way it always did whenever my face decided it was a good time to turn scarlet. Something too strong to be called butterflies stirred in my stomach—it was how I imagined stage fright must feel. Both exciting and terrifying. He was tall. As a girl who is 5’9”, I always noticed height. He had to be at least 6’2”. And slim, but not skinny, built with the long muscles of an athlete. The dark hair that had been tucked behind his ears, now hung lose around a wide face that was decorated with high cheekbones, and the kind of full lips that made women jealous. All of these things made him gorgeous, but his eyes made him breathtaking. They were large, almond shaped, and the color of moss. Green, but not magic green, and they stood out against his tan skin. I had seen good looking men, but this man was startling. And he definitely had to be from out of town. In a place the size of Brooklyn, you learn most everyone’s faces, even if you don’t personally know them, and I was certain that I had never seen this man before. I would remember a face like that. And he had just said something, while I was staring at him. Dangit. “I said that you shouldn’t apologize to her. She was rude to you. You have nothing to be sorry for.” His lips parted, showing white, straight teeth that wouldn’t have been out of place in a toothpaste ad. Of course his smile would be as beautiful as he is. I touched my tangled pony tail, and for the first time in my life, I wished I had listened to Delia and actually fixed my hair and changed clothes before coming into town. But he had spoken to me. That meant I had to answer. I tried to think, but every word in my vocabulary decided to vanish, leaving me mute. Mute and homely, a winning combination, I thought. I shook my head. Good. At least I could move. I was stupid in my silence, but his rambling was somehow adorable. “You heard that?” I croaked. My family’s freakiness had been on full display. And then there were those disgusting threats. Myrtle’s accusations churned in my stomach, curdling and sour like old milk. The feeling clashed against the butterflies and their eager fear, and suddenly I felt ill. I clamped my mouth shut and took a deep breath through my nose, as a cold sweat prickled across my upper lip. Throwing up would have been bad, but throwing up in front of this man, who was a million times better looking than me, and had just heard from the most horrible source on the planet about how weird I was, would be a whole new kind of terrible. I could not be the story about that time that he met this nut-case girl in po-dunk Mississippi and she threw up all over his shoes. Oh God. Calm down, Tallulah. He stuck out his hand, and smiled. “I’m Logan, by the way,” he said. I stared, open-mouthed, at the hand in front of me. Every part of me wanted to grab that hand and twine my fingers through his and keep them there forever. Something about him pulled at me, and I wondered if he felt it, too: this beautiful trance that wouldn’t let me turn and leave, but terrified me too much to simply reach out and shake his hand. My heart pounded out the seconds as they lumbered by. “This is the part where you tell me your name,” he said, dropping his hand to his side. You ain’t nothing but a hound dog… Elvis’ voice sang out from the ugly clock on the wall, snapping me out of my stupor. It was 4:00. I had to get Delia. “I. I gotta go,” I mumbled, turning on my heels and bolting out the door. Em Shotwell is the author of Blackbird Summer with City Owl Press. She believes the most interesting characters are the ones who live on the sidelines, and that the smallest towns often hide the biggest secrets. Em’s characters will bless your heart between sips of sweet tea- but be warned! There is often more to them than meets the eye. 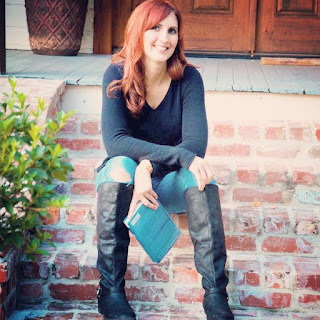 She loves to craft stories around outcasts and weirdos with a spark of magic and a penchant for finding trouble.She lives in South Louisiana with a husband who spoils her and two mini-superheroes who call her mom. When she isn’t writing about misfits and oddballs, she enjoys spending time outdoors hiking, and debating Doctor Who facts with her obsessed ten year old. Thank you for hosting BLACKBIRD SUMMER today!